When you first walk in there is a sofa seating area where the winner of the battle over who is going to change the baby's nappy can sit and play on the phone whilst their other half does the dirty work. 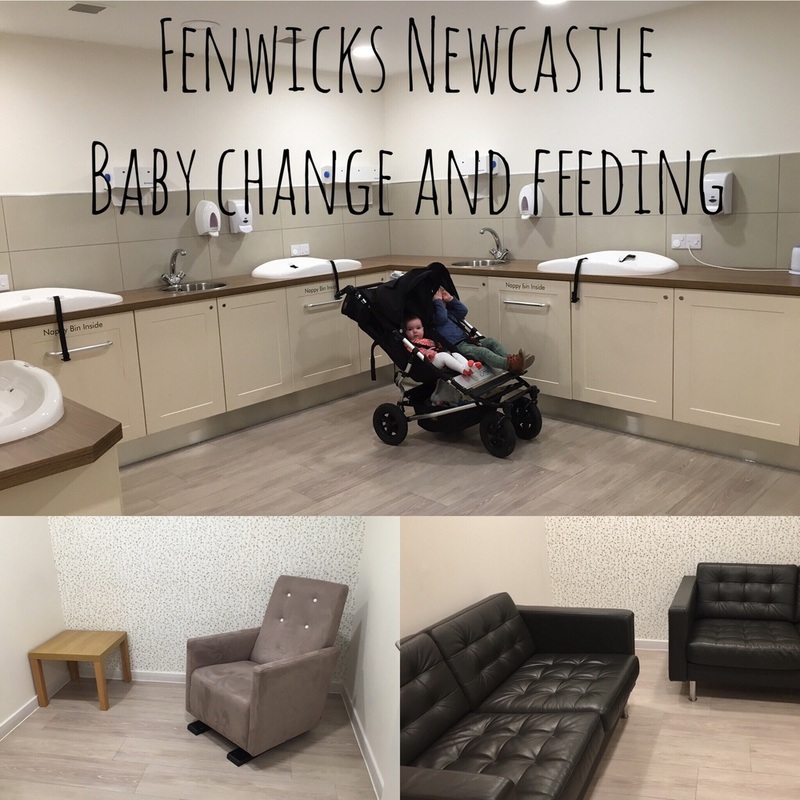 Really appreciate that Fenwick have put this in so the baby's entourage can at least sit down comfortably whilst they are being changed or fed. There is then a lockable adult's toilet with a baby change mat included so you can go to the loo without having to leave the kids outside. There was loads of room in there to take in the buggy too - always handy as just yesterday I made the mistake of letting my toddler free whilst I used the toilet. Safe to say the people in Blaydon Library were not expecting to see me sitting on the toilet when the door swung open. Joy. The main biggest area is the communal baby change area, which is decked out with everything that you might need and all handily placed to be able to access even when keeping one hand on a squirmy suicidal baby. There were 4 change stations, all with access to disposable change mat liners, a basin, soap, and a nappy bin which was stored away in a drawer next to the change mat. There was also a bottle warmer here to use. Finally there were 4 private, lockable baby feeding rooms, with a cosy reclining chair, and a table in each room. Really impressed that Fenwick have put so much thought into making this area so comfortable and pleasant to be in. More than once I've fed the baby in a smelly stuffy room, virtually sitting right on top of the nappy bin, so it makes a really nice change. I'm more than happy to feed the baby everywhere and anywhere, but its good to know this area is here if i needed it. I'll definitely be coming back to use the changing facilities if I'm in the city centre and needing to change either of the kids.